TMI alert: Be warned right now, this promises to be the crappiest feature we have ever had on Casual Runner. And yes, also be prepared for some rather unfortunate puns. When Mike ran the 2015 Akron Half Marathon, he saw one spectator’s sign that made him laugh out loud. It said: “After Mile 5, don’t trust a fart!” And it got us all thinking…. Sometimes having to go at the starting line means having to wait in a long line, so give yourself plenty of time. Ok, for anyone who has been running long enough, you know that runners – whether they are Casual or otherwise – like to share…and some would even say overshare! That is why we always try to make sure to include TMI alerts. But the reality is that sharing personal experiences is the only way that our readers can learn from other Casual Runners. So here we go, or, shall we say, let’s talk about – THE GO. To help young kids in their potty training, there is a popular book titled Everyone Poops. Once you are done giggling…ok, are you done giggling? Its ok, we’ll wait. The truth is, yes, everyone DOES poop, and this includes Casual Runners. While many Casual Runners obsessively discuss the fun parts of their race plans – cool running shoes, fashionable running clothes, awesome play lists, yadda yadda yadda – the reality is that your bathroom plan or strategy can make or break your race day experience. Trust us, we know. Remember what happened to Mike in the second half of his first ever marathon? If not, you can check it out here. Jennifer has also mentioned “the go” in several of her race reviews. Suffice to say, when it comes to having to go, you want to make sure you are in know. So we spoke with some readers and gathered our Top 10 tips for planning your race day bathroom strategies, and here they are. Everyone thinks they need a huge pasta dinner the night before the race, and many events even sell tickets to special events that will ply you with a dinner full of carby deliciousness. Conversely, some runners, like Mike however, learned that eating a big meal the night before a morning race will only ensure that they will have to go during the race. While others like a big dinner before a race, these Casual Runners prefer to eat a larger lunch, and have a light snack for dinner and breakfast, which allows plenty of time to clear out the system. Find what works best for you before race weekend. Even if you do not think that you HAVE to go pre-race, you may want to give it a try anyway. 9) Clear out your system. Ok, this one sounds obvious, but on race morning those alarm clocks go off EARLY and we all try to grab a few extra minutes of pillow time. If you can, set your alarm clock a few minutes early to give yourself time to, um, clear the decks fully before you head out the door. The less you have in your system, the less there will be to, um, come out during the race. 8) Have a clean slate. The reality is that sometimes toilet paper rips, tears, or shreds, and there may be small pieces left behind. If this happens, you will have some terribly awful rubbing that, over the course of 6.2, 13.1, or 26.2 miles can result in some truly awful chafing. So take a moment to make sure you that you have fully cleared everything, including any toilet paper that may be left behind. 7) Plan your breakfast carefully. Do not overdo it on race morning. Remember two things: 1) eat familiar, safe foods that won’t cause you discomfort; and 2) what goes down, must come out. Jennifer has fine tuned her race day diet to what works for her, and she does not stray from it. Steve goes with a simple banana and a cup of coffee. Mike likes to have bland carbs (plain bagels and the occasional donut) followed by some sports drink to hydrate. Find what works for you and don’t overdo it. 6) Port a potty problems. 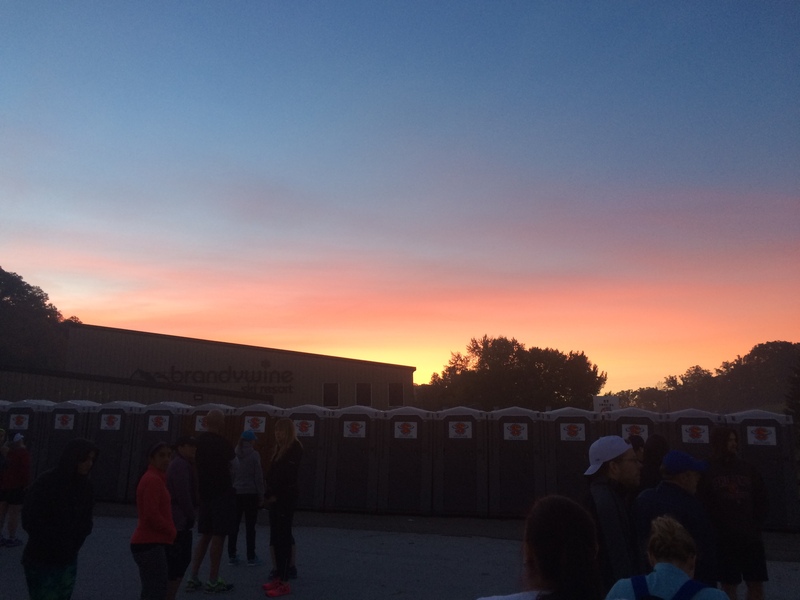 If you have never been to a race before, be prepared for long lines at the bathrooms. No matter how many bathrooms race organizers provide, it will never be enough. Just accept this reality and make sure you get to the start area early enough to spend 20 minutes or so in line to clear out your system before loading into your corral. Even then, that might not be enough. Runners pee in public, its just a reality. We once heard from someone who was appalled at runners peeing by the side of the road during the 2015 Walt Disney World Half Marathon. We could not understand why exactly, but she was absolutely beside herself at this occurrence. If peeing by a bush or a tree is not your thing, don’t do it. But please don’t make a big deal when others do (provided they are being discreet and respectful), keep in mind, they are keeping the lines for the actual bathrooms shorter for you. Remember what we said in #8? Well, when you are mid-race and you do have to stop, you will be sweaty. This presents unique challenges when it comes to using toilet paper. You see, toilet paper is designed to dissolve in water, so when it makes contact with your sweat…well, you get the idea. We know you are anxious and don’t want a pit stop to kill your chip time, but be prepared for this eventuality and make sure to clean up properly. Along these same lines, if you are wearing compression shorts or other components to a race day costume, it may make squatting in a bathroom a little more challenging. Like Scar said in the Lion King, be prepared! 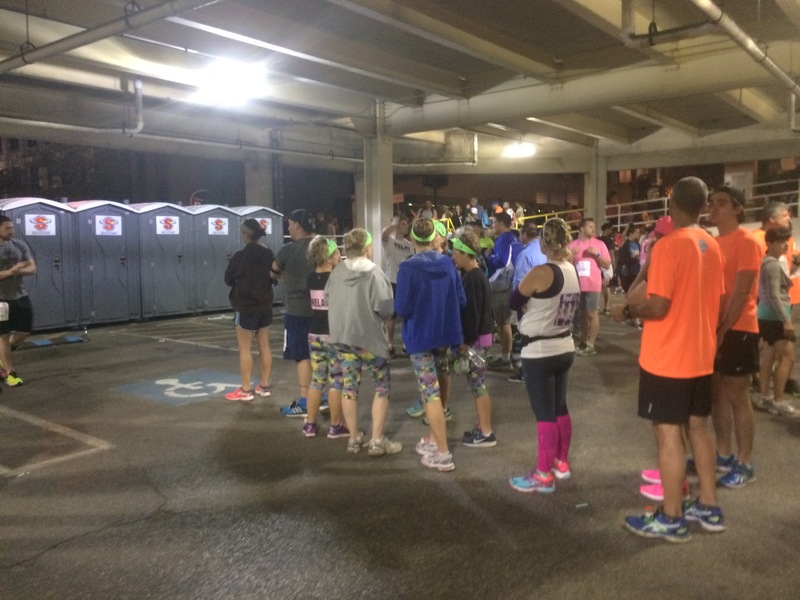 Some runners prefer to carry their own toilet paper with them – they want a better quality than they will find in a port a potty, or they are concerned the on-course port a potties may run out. Regardless of your reasoning for bringing your own, please remember to put it in a sealed Ziplock bag. If you do not, when you need it, all you will have is a soggy, clump mess due to moisture from sweat, rain, spills at water stations, or whatever. In-race fuels can be necessary, but they may also make a bad bathroom situation worse if you are not careful. 2) Don’t poke the bear. 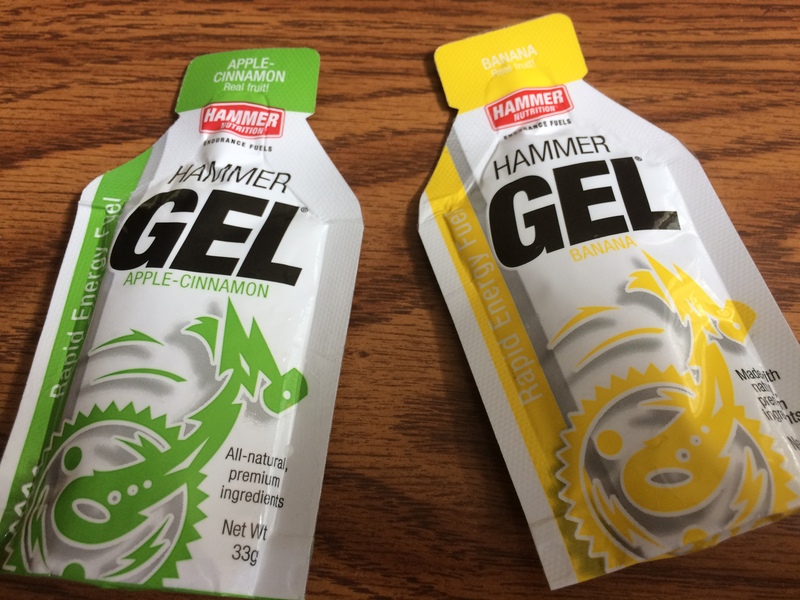 Sports drinks, gels, and shot blocks are designed to give you quick carbs. However, if you are feeling the rumblies in the tummy mid-race, blasting your system with extra carbs may not be the best thing for you. You may have to adjust your nutrition plan on fly and lay off the quick carbs for a cycle or two while your body’s systems reset themselves and you are comfortable again. 1) Mile X, don’t trust a fart. And now we are back full circle. We have all heard the horror story of runners who went to give themselves a power boost and ended up discharging more than they bargained for. A lot can happen to your body over a long run, especially as exhaustion sets in and your muscles begin to involuntarily relax. The only way to avoid this is to listen to your body. If it tells you to go, then GO. Don’t be a hero, don’t worry about sacrificing some precious minutes on the clock, just go. 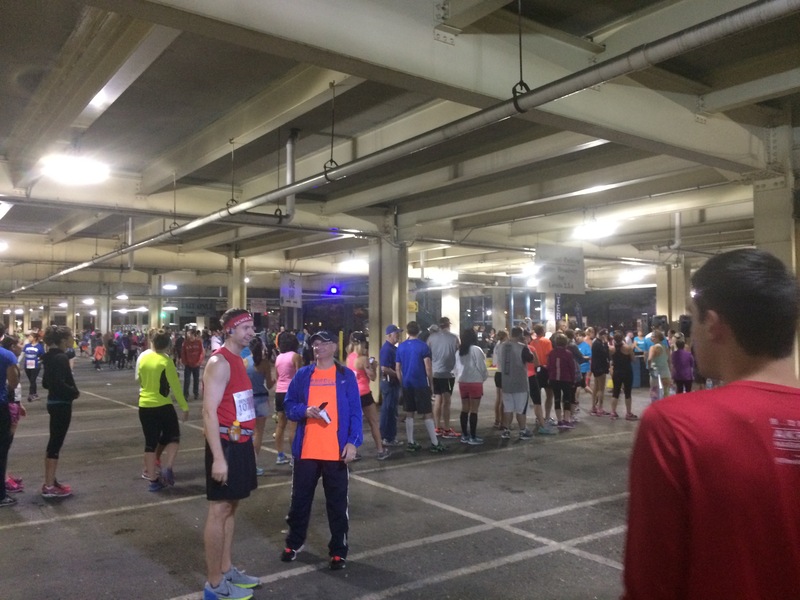 We heard from a reader who missed qualifying for Boston by less than a minute because she had to stop for a bathroom break. She said that, while she was disappointed, she was much happier that she stopped than what the alternative could have been. One last bonus tip. While sinks are often hard to come by on-course and in pre-race areas, good race directors have been ensuring that hand sanitizer is available – USE IT. You will be sweating a lot during your race, the last thing you want to do is wipe your face with unclean hands. But also be careful. After you sanitize your hands, you may want to wipe your hands clean on the grass or your pants, because you do not want to inadvertently get any in your eyes, as that will cause lots of pain and discomfort. Long bathroom lines are a reality at most race events. – Help in finding ways to motivate yourself, even when you have no motivation. – Our checklist of the top 10 things you need to know to get up and get on your way to becoming a Casual Runner. – Ask yourself: where is your own personal starting line? – You need to buy the right pair (or pairs) of running shoes, because a good pair of running shoes are, after all, a Casual Runner’s best friend. 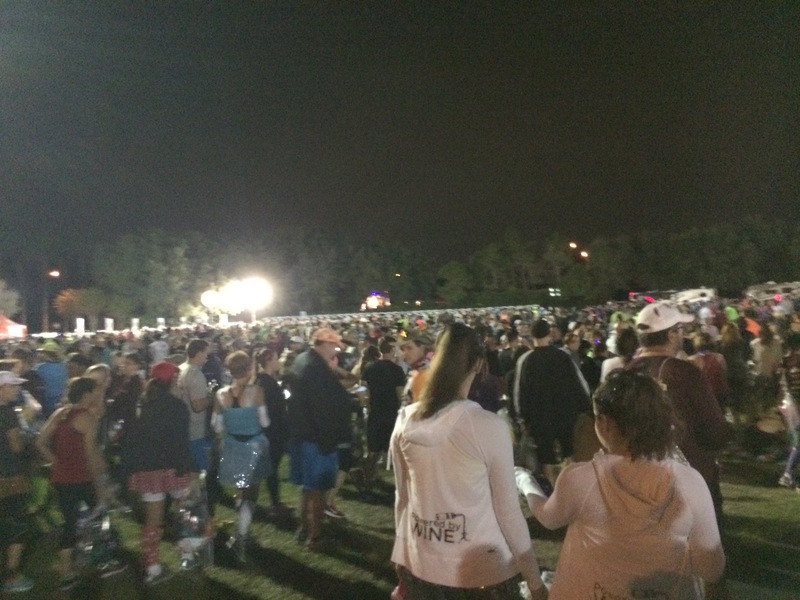 – Recommendations for picking your first race, the Top 10 Things to Know In Selecting a RunDisney Event, and my Top 10 Reasons Why I Run to runDisney. – A look back on the Team’s New Year’s Resolutions and a reminder of the need to stay positive. – The importance of keeping your Casual Running adventure in perspective and finding your stride.